Can You Believe Someone's Selling This Life-Size, Hand-Made Transformers Wine Rack on Craigslist? Usually browsing Craiglist's 'for sale' section is like wandering through a junkyard, but every once in a while you come across a diamond in the rough. 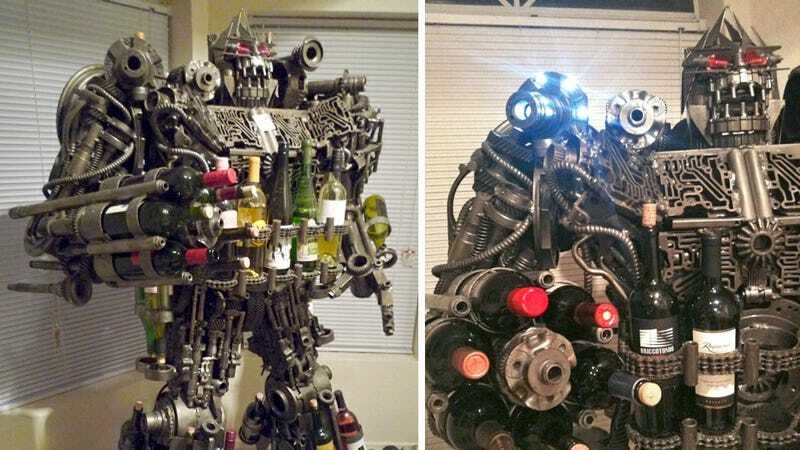 Like finding a Picasso at a yard sale, someone actually wants to sell this breathtaking Transformers-like wine rack sculpture. For a mere $7,000 you're not only getting six feet and 1,000 pounds of used transmission parts artistically welded together, you're also getting a piece of Americana, and a truly stunning work of art. But don't forget it's also functional, holding up to 32 wine bottles or the occasional Christmas tree, and serving as a great reason to re-decorate your living room in a matching dull gray motif.